Dr. Michael S. Kelley joined the Planetary Science Division at NASA Headquarters in 2008. In addition to more than twenty years of geological research, teaching, and field experience, Mike brought to the Division private sector corporate experience and many years of service to the planetary science community. 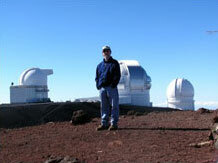 He currently serves as a Program Scientist for the Near-Earth Object Observations Program. Mike oversees the Antarctic Search for Meteorites (ANSMET) Program, serves as the program scientist for the NEOWISE mission, and is a Discipline Scientist for the Solar System Observations program. In addition to his duties in planetary defense, Mike serves as the program scientist for the Mars Reconnaissance Orbiter, Mars Odyssey, and Dawn missions, and previously for the EPOXI and Stardust-NExT comet encounter missions and the Planetary Data System. Prior to joining NASA Headquarters, Mike held a National Research Council Fellowship at Johnson Space Center, and was a research faculty member at Georgia Southern University. He was a Visiting Astronomer at the NASA Infrared Telescope Facility for almost two decades, and served as chair of the Planetary Geology Division of the Geological Society of America and its award committees. He was awarded the Antarctic Service medal for his participation in the ANSMET Program, he is a Fellow of the Geological Society of America, and recipient of the Ronald Greeley Award for Distinguished Service. Asteroid (4477) 1983 SB was renamed “4477 Kelley” in recognition of Mike’s contributions to Planetary Science.